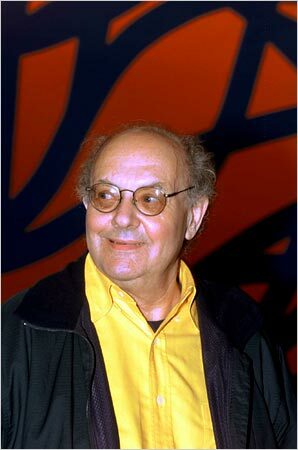 Sol LeWitt is an American modern artist who is famous in his field for his work in Conceptual Art. He mainly created sculptures and wall drawings following the ideas of Minimalism. 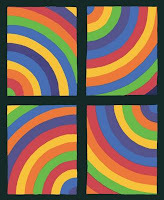 Sol LeWitt was born in 1928 in Hartford, Connecticut (USA). He came from a Jewish family. He showed a strong interest in art from a very early age on, and therefore took art classes at the Wadsworth Atheneum in Hartford. He then deepened his artistic education at Syracuse University. After his studies he traveled to Europe, before serving in the Korean War. In 1953 he moved to New York where he went back to studying but this time at the School of Visual Arts (Cartoonists and Illustrators School). Following his studies he worked for the design of the magazine Seventeen. Nevertheless, it is his job as architectural draftsman that most influenced his later art, in which geometric precision is very prominent. In the 1960s he taught at different schools in New York. After a very prolific career he died of cancer in 2007 in his native state, Connecticut. His works can be found amongst others in the Tate Modern (London), the Stedelijk van Abbemuseum (Amsterdam), Centre George Pompidou (Paris), etc. Concerning his artistic career, LeWitt was at first associated with the Minimalist art movement, because of his use of geometric forms. Later in his career he became associated with the Conceptual Art movement, and because of this is sometimes called ‘the father of Conceptual Art’. He had his own theory of art, which he expressed in his “Paragraphs on Conceptual Art” in 1967. In his opinion, the idea is more important than the final form. The work of art is just a medium to transmit the idea. In the 1960s LeWitt began working on what he called ‘structures’ (three-dimensional sculptures), among which his Cubes are the most famous. These sculptures were usually made of aluminum or steel. Over the years, he brought many variations to his Cubes, making some out of stacked cinder blocks, or concrete blocks, piling them up in towers, etc. 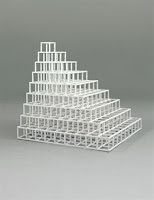 Sol LeWitt is mainly known as a sculptor; but he also worked in 2D. He created more than 50 artist’s books linked to the idea of conceptual art. Further he has executed more than 1200 wall drawings and numerous works on paper. He drew the plans but he did not usually paint them himself: letting a group of assistants do the work. Again his drawings contain geometrical or more abstract forms. They are painted in strong colours (yellow, blue, red, etc.) or simply in black and white (using graphite, crayon and India ink). As a Minimalist LeWitt tried to reduce his works more and more to their original state. Sometimes they are just models or “pre-drafts” that indicate the various steps to make a drawing. Those working drawings enable artists to reproduce his paintings even now. Sol LeWitt’s influence on modern art is undeniable. He helped to define Conceptual Art and still inspires young artists today.